In the Amazon era, Whole Foods is already getting cheaper. But there’s a potential price for those discounted groceries. 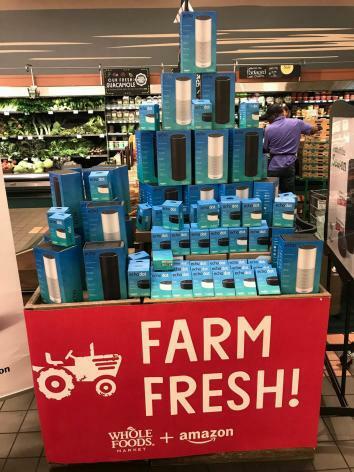 AmazonFresh Pickup location in Seattle and the Whole Foods Market in New York City as seen on June 16. Photos by David Ryder/Getty Images and Timothy A. Clary/AFP/Getty Images. When Whole Foods shoppers walked into a store Monday, they were met with a likely welcome change: Prices on some of the most popular items have dropped dramatically. They’ll spend 38 percent less on bananas and 43 percent less on organic Fuji apples. Even avocados, that Whole Foodsiest of fruits, got a 20-cent price cut. We have Amazon’s purchase of the grocery chain to thank. And for federal antitrust regulators, this would seem to be a vindication of their decision to quickly and painlessly green-light the deal last week. For decades, concerns about anti-democratic control and monopolistic power led to crackdowns on consolidation, among both direct competitors and different but complementary businesses. But the focus has narrowed considerably since the 1970s, and now typically the only metric for whether a marriage between corporate behemoths could be harmful is the impact on consumer prices. Certainly industry consolidation can, and has, led to companies using their increased power to jack up prices, hurting consumers’ wallets. But even when prices go down, as we saw Monday while we browsed for grass-fed ground beef (also on sale! ), other ill effects can still follow that hurt Americans and the economy. The suddenly lower prices at Whole Foods, then, are the perfect example of how shortsighted antitrust regulation has become. That one small victory could very well be dwarfed by the pain felt by food producers, grocery store competitors and, ultimately, the American workforce. But that doesn’t mean the deal won’t impact competition in the larger economy. We’ve already seen the monopoly power that can be exerted through vertical integration: Luxottica controls not just most of the companies that produce eyeglasses, for example, but also the ones that sell them to you, like LensCrafters and Sunglass Hut. That means it can set prices as high as it wants and that it’s pretty tough for anyone else to get in on the game. It’s hard to deny that Amazon hasn’t already distorted markets with its growing power. In 2013, it sold more than the next 12 online retailers combined, and some estimates have it capturing nearly half of all online shopping. More than half of all online shoppers start perusing at Amazon.com. (Disclosure: Slate is an Amazon affiliate and may receive a commission from purchases you make through our links.) “In addition to being a retailer, it is a marketing platform, a delivery and logistics network, a payment service, a credit lender, an auction house, a major book publisher, a producer of television and films, a fashion designer, a hardware manufacturer, and a leading provider of cloud server space and computing power,” Yale Law School student Lina Khan wrote in an influential look at Amazon’s anti-competitive tendencies. It got there mainly through deals like the ones with Whole Foods: buying up other companies. Now it’s a grocer, too. Its incredible ability to hoover up consumer loyalty and market share is why markets reacted the way they did to the news of its acquisition of Whole Foods. Stocks for other grocery stores and businesses that have moved into the space dropped dramatically on the expectation that they would soon face intense pressure to drop prices in order to lure customers. So did stocks for food suppliers themselves on the assumption that they, too, would have to cut prices to appease Amazon and get on Whole Foods’ shelves. Stocks fell again after news broke that Amazon would indeed slash food prices on Monday. Yet Amazon has thus far mostly avoided antitrust scrutiny for one crucial reason: It undercuts prices. Rather than use its position of influence to drive up profit through higher consumer costs, its business model has emphasized scale and market share over larger returns, and part of how it got there was by forcing prices as low as it could. It is this very feature of Amazon’s business model, however, that makes it such a predatory actor for everyone else around it. It uses its influence in online shopping to pressure suppliers to dramatically drop their prices, wringing as much discount from their margins as it can. It pushes for practices in supplier warehouses that have become notorious for the ill treatment of workers—but that model helps it deliver cheap goods incredibly quickly, and few suppliers can refuse to participate. These practices could spell danger for a variety of American workers. 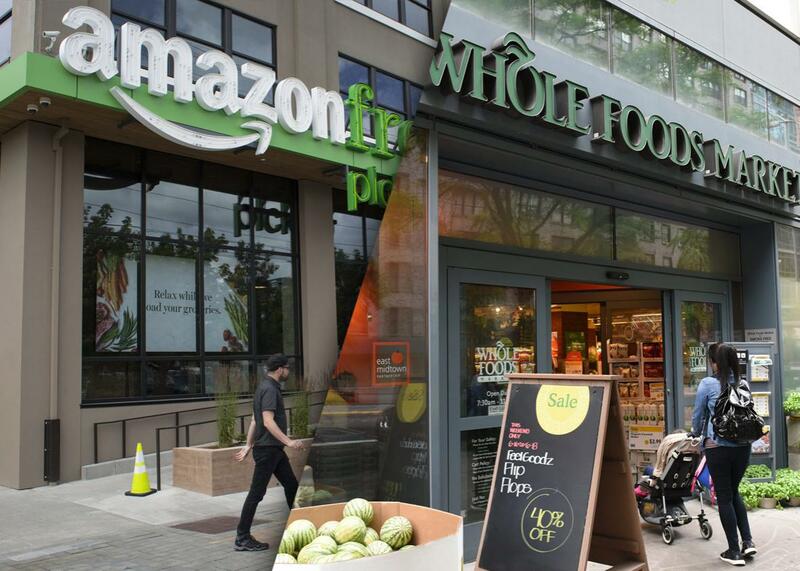 Amazon’s ownership could pose a risk to the smaller local farms that have thus far supplied food to Whole Foods if they can’t deliver at cutthroat rates. One place they and other food producers may look to cut: wages for workers. As David Dayen has pointed out, thanks in large part to decent wages and benefits Whole Foods employees aren’t unionized in an industry where most are. That, too, is put at risk by an owner that’s focused exclusively on low prices and quick service, both within Whole Foods’ walls and at other grocery store workplaces that now have to compete with it. Between the 1930s and 1960s, in the heyday of anti-monopoly fervor, these problems would have been cause for quite a lot of concern. Taking an economic structuralist view of concentration, regulators and courts assumed that concentrated markets would by necessity foster anti-competitive outcomes, such as price fixing, collusion, blocking new entrants, and using their outsize power to squeeze suppliers, consumers, and workers. Prices, market share, and size weren’t the only considerations: Things like conflict of interest and the ability to ward off competition also counted against deals. The Supreme Court held in 1963 that a merger that would result in control of more than 30 percent of any market was unlawful. But then Robert Bork published The Antitrust Paradox, a book that changed an entire regulatory regime. He argued that the sole purpose of antitrust policing should be to maximize consumer welfare—mostly, to ensure that prices don’t increase too much. The assumptions shifted, with regulators and courts taking for granted that markets are efficient and companies will seek to maximize profits. The only check needed was to ensure prices didn’t rise above competitive levels. We still haven’t moved very far away from this framework, even as antitrust enforcement has come back into political vogue. Hillary Clinton made beefed-up antitrust enforcement a main plank of her economic agenda during the presidential election. The Democratic Party has now taken up the torch, putting a spotlight on how the government has allowed business to “tilt … the economic playing field in favor of the wealthy and powerful,” in the words of Senate Minority Leader Chuck Schumer. Their “Better Deal” agenda promises to “crack down on monopolies and the concentration of economic power” by, in part, creating a new “Trust Buster” entity to more closely scrutinize proposed mergers. Yet the Trust Buster would still be focused by and large on the impact on consumer prices. Democrats singled out the airline, beer, eyeglass, food, and telecom industries as particularly concentrated and worrisome, but mostly because costs have risen. This isn’t surprising: Voters are quick to feel outrage over prices that pinch their budgets. The harm of increased concentration runs much deeper, however. When only a few large players exist in an industry, they have little reason to increase compensation—or even the number of jobs—given that workers in the space have few other places to go. If they don’t like the conditions, well then, too bad. Industries that have experienced the biggest increases in concentration, in fact, have also seen the largest declines in workers’ share of profits. A rigid focus just on consumer prices misses this and all other negative outcomes of today’s increasing industry concentration, which also includes political dominance. Reverting back to a broader view of antitrust regulation and what counts as deal breakers for American consumers, workers, and voters might have, if not stopped the Amazon–Whole Foods deal, at least slowed it down and offered an opportunity for the government to demand concessions. Perhaps we don’t need to go back to the days of Teddy Roosevelt’s trust-busting. But in an era of stagnant wages and rising income inequality, it’s worth asking what role monopolies play. Consumers may rejoice that Whole Foods’ prices, like $6 for water with asparagus stalks in it, are coming down. It’s a happy side effect. But it can’t cover up the deeper disease of increasing monopoly power throughout the economy and the current antitrust regime’s utter inability to keep it in check.